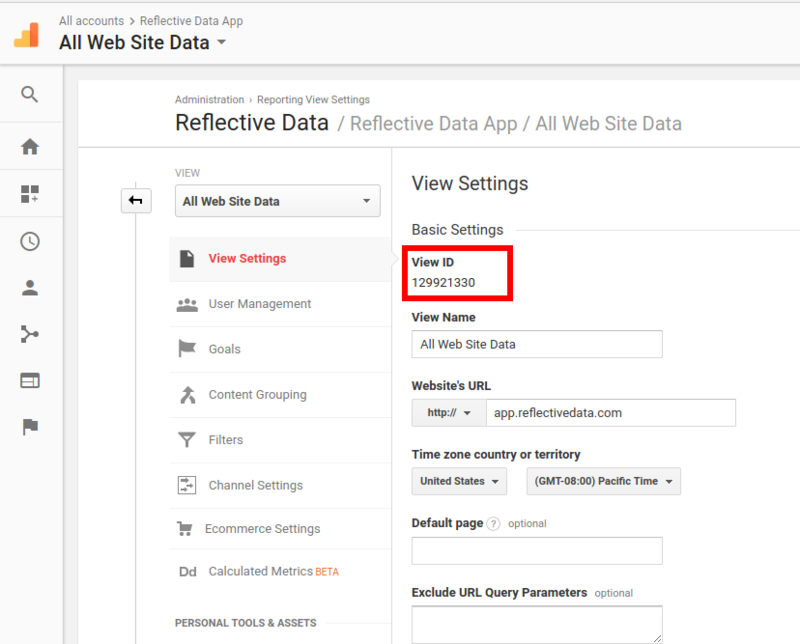 In order to build Google Analytics reports in Reflective Data, you need to define which view is being used for reporting. This guide will walk you through the steps required for doing so. You can find “Account settings” in the main menu (left-hand side in the main platform). In account settings, you will find the “Google Analytics” section. There’s a field “View ID” that you need to fill. Go to Google Analytics and pick the right view, the one that you’d like to use for reporting in Reflective Data. Once you’ve picked the right view, click on “Admin” (bottom left). In the admin section, click on “View Settings” (top right). In the view settings view, you will find the view ID. Now, all you have to do is to copy this view ID and paste it into the field in Reflective Data account settings. Make sure you are using View ID and not the Property ID (the one many 3rd party tools and integrations require).